A big thank you to Mags and Rachel for kindly sending on this blog award! I used to look at those on other blogs and wonder, how do earn one of those? Now I know! :) I've been incredibly busy so my apologies for not posting sooner. 1. Thank the person that has given it to you. 4. Name 7 things about yourself that nobody knows. 5. 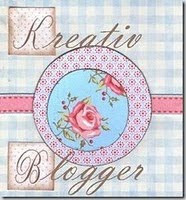 Nominiate 7 Kreative Bloggers. 6. Post link to the 7 blogs that you nominate. 7. Leave a comment on each of the blogs nominated. 1. I am an office supply nerd! Can't stay away from new pens and clips. 2. My parents were hippies; hence the name Daisy. 3. I love my work but it's very intense; minis are my emotional release. 4. I am not a celebrity worshipper. 5. I love watching recorded shows in the wee hours of the morning. 6. I am a chronic procrastinator. 7. I am an antique fanatic furniture but only own one item! How did that happen?